Thailand has announced its latest "D-Day" in the war against litter. This one is July 21st when the environment minister General Surasak Kanjanarat is declaring war on plastic bags. 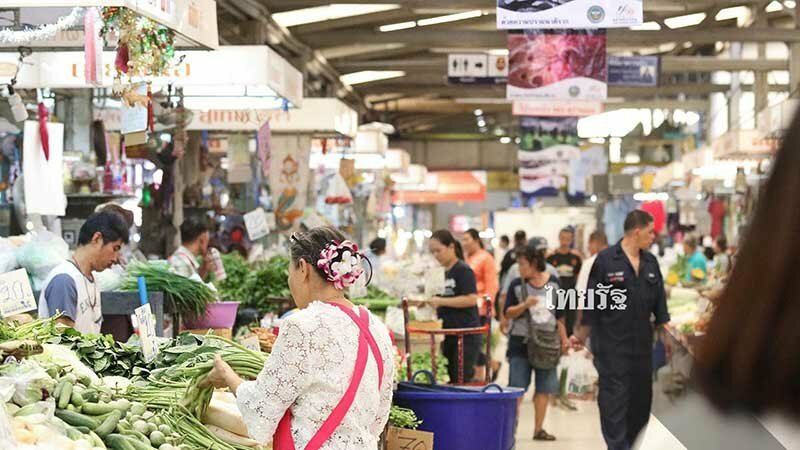 In the initial face of the battle the Thai authorities will be conducting a charm offensive to stop traders and the public using so many plastic bags at fresh food markets nationwide. Gen Surasak said yesterday that the country uses a staggering 45 billion bags a year. Forty per cent of these are used at fresh food markets. That is around 18 billion bags. So he has decided to start a campaign. It is called: "Doing good from the heart. Less Taking, Less Giving, Less Using Plastic Bags". Signage will be going up at 7,000 markets nationwide. The aim is to reduce plastic bag usage by 20% or 3.6 billion bags at markets by next year. There is also a target to reduce foam container usage by 10% by 2019. Thai Rath also said in their story that some 400,000 convenience stores nationwide make up 30% of plastic bag usage or 13.5 billion bags annually. No mention was made when the government might address the problem at these kind of stores. Thaivisa notes that the term "sai thung" (put it in a bag) is one of the first expressions people learn when trying to master the Thai language. May we suggest that people learn "may (tong) sai thung" (not (necessary to) use a bag) to help the campaign! we all need to do a little more. "....the environment minister General Surasak Kanjanarat is declaring war on plastic bags". This so called "declaration of war" on plastic bags has more to do with being seen to be doing something rather than actually doing anything positive. Nothing more than platitudinous waffle. All ministers need to play this game from time to time to impress the PM and have him think they are doing their job effectively. The frequency of such displays is usually in direct proportion to their ineffectiveness as a Minister. Starting the campaign at food markets maybe isn't the brightest of ideas. Normally the products are not 'dry' and to mix the products in the customer's own bag, as low as the risk maybe, isn't the most hygienic way of bringing wares home. Especially with the number of reports about the pesticides and other chemicals being used in the growing stages. Aha, I take it that's Cadbury's Law. Another joke by the powers that be in Thailand, Waste of time, Just STOP USING PLASTIC. PERIOD! Over ten years ago Hawaii, USA stopped using plastic bags. You never see them anymore. We go grocery shopping with a reusable canvas bag brought from home. just like any other government when they need to control something.tax the nuts out of it. thats given the industrie time to develop alternatives with a law frame , that would alloud these investments. already there are alternative plastic factorys in place on a small scale here in thailand. but ,sorry to tell its hopsless in thailand, and maybe already to late. OK General, how about Thailand going down this route, on the off-chance you want something more than a photo-opportunity. Been using enviro friendly reusable bags for years. Used to incredulous looks from staff when saying "Mai sai tung". However, nowadays the occassional "Di maak" and big smiles show some progress. Yes, this is all fine. However, in Thailand people buy ready-made food which is sold in small plastc bags, how would you handle that? No problem. The PM could solve it at a stroke: Article 44 to make food illegal.